Home / HEALTH / Safe beauty products that WORK! When our daughter was first diagnosed with cancer, I threw out all the conventional and processed food, toxic cleaning items and carcinogen-filled beauty products I owned. I replaced them with organic, green and safe alternatives. However, it meant several of my beauty products became extremely natural and were sometimes too organic. Does that make sense? My conditioner no longer made my hair soft and my lotion was now coconut oil. The past few years I have slowly started finding products that I really love. To my surprise, there are safe products that actually work! These are only a few of my current favorites. Luckily for me, our town has an awesome beauty store that sells safe and toxic-free items that make us all feel beautiful. Thank you Beau Tea Bar for giving us safe options that work! If you can’t drop in, check out their website. Ask questions, the owner is so helpful! RMS Make Up– This whole line is awesome! I have only tried the MASCARA and BRONZER and I am already in love. My friends adore the eye shadows and lip gloss! Great price point and it works! The defining mascara is my pick and the bronzer compliments everyone! Laurel Whole Plant Organics– Facial Balm- Perfect face moisturizer for everyday use under your SPF! May Lindstrom Skin– The Blue Cocoon- An unbelievable moisturizer especially for this dry and chilly weather. Pricey but lasts a long time! I use it at night. This is my favorite beauty app. It ranks each product according to its ingredients. I have included a little video as well. Think Dirty, Shop Clean. 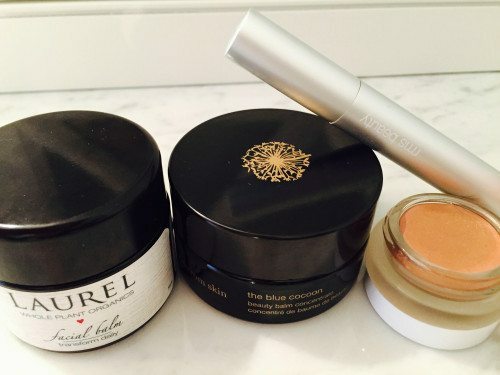 Have a favorite chemical-free beauty product? What is it? !